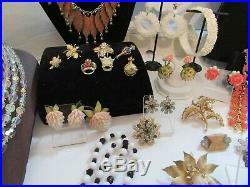 NICE COLLECTION OF VINTAGE JEWELRY ALL IN GOOD TO MINT CONDITION , SOME PIECES ARE SIGNED BY DESIGNERS AS PEGASUS CORO, CORO, LADY ELLEN, SARAH COVENTRY, SWAROVSKI KARU, MICHAELA VON HABSBURG AND OTHERS. THIS COLLECTION APPROXIMATELY HAS. 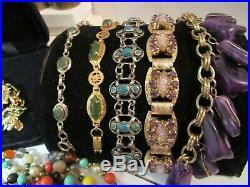 BRACELETS, BANGLES- 21, BEAUTIFUL GOLD PLATED AND GREEN ENAMEL LINK BRACELET BY DESIGNER AUSTRIAN DUCHESS MICHAELA VON HABSBURG, 2- GOLD TONE ETCHED HINGED VICTORIAN REVIVAL WIDE HINGE BRACELETS, WHITE CARVED CELLULOID BANGLE MARKED JAPAN, AND MANY OTHER BRACELETS WITH RHINESTONES AND ENAMELING. 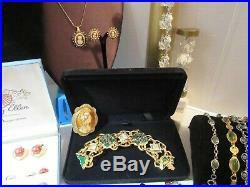 NECKLACES- LOVELY GOLD FILLED VICTORIAN REVIVAL NECKLACE SIGNED KARU, SEVERAL FLAPPER GLASS NECKLACES, CARVED BALTIC AMBER LEAF PENDANT WITH GF CHAIN, AND OTHER S. EARRING PAIRS (COUNTED EACH PAIR OS 1)- 7, LARGE CELLULOID WHITE HOOP “CARVED” STYLE, BEAUTIFUL PAIR OF COLORED CELLULOID FLOWER EARRINGS AND OTHERS. PINS, BROOCHES-32, GROUPING OF SCATTER PINS OF ROYAL MOTIF, CROWNS, SCEPTER, CHALIS, 2 BEES, larger bee pin is marked 925, LARGE CELLULOID FAUX CAMEO BROOCH, BEAUTIFUL OVAL BRASS FRAMED BLACK GLASS WITH TURQUOISE GLASS BEADS AND OTHER STONES SIGNED BY “DESIGNS BY ROBERT”, ART DECO CLEAR STONE DRESS CLIPS, AND MANY OTHER PINS AND BROOCHES. 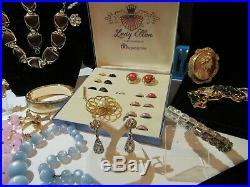 THERE ARE 16 SETS , BROOCHES & EARRINGS, NECKLACE & EARRINGS, NECKLACES & BRACELETS- THERE IS A SARAH COVENTRY NECKLACE AND BRACELET ENAMEL GRAPES AND GRAPE LEAF SET STILL IN THERE ORIGINAL TUBE PACKAGING, SILVER TONE AND BLUE STONE DANGLE NECKLACE AD BRACELET (ON STAND IN BACK) IS SIGNED CORO, THE COPPER FRINGE EMBOSSED LEAF STYLE NECKLACE AND EARRING SET IS MARKED ERA AND IS ALSO MARKED 925, SILVERTONE RHINESTONE AND BLACK ENAMEL CHUNKY TIGER MOTIF NECKLACE AND EARRING SET, BROWN THERMOSET NECKLACE AND BRACELET SET, FAUX CAMEO AND PEARL NECKLACE AND EARRING SET (PENDANT CAN ALSO BE WORN AS A PIN), BEAUTIFUL SALMON COLORED CELLULOID FAUX CARVED FLOWER AND PEARL BRACELET AND EARRING SET, LOVELY ARTISAN MADE BRACELET AND EARRING SET MADE FROM VINTAGE VICTORIAN BUTTONS AND OR PIECES OF JEWELRY, LADY ELLEN 1950’S MAGNETIC INTERCHANGEABLE EARRINGS AND BROOCH STILL INIT’S ORIGINAL BOX AND ALL PIECES ARE THERE. 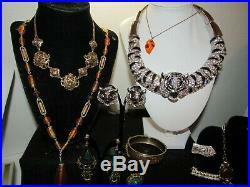 SO MANY OTHER SETS OF VARIOUS MEDIUMS AND STYLES THAT AE JUST AS NICE AS THE ONE S I DESCRIBED. 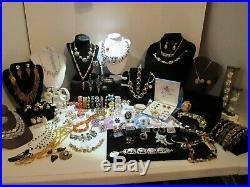 THIS LOT ALSO HAS MANY PIECES OF STERLING JEWELRY MOSTLY WHAT IS ON THE BLACK DISPLAY BOARD IS ALL STERLING. THERE IS A WIDE ETCHED STERLING CUFF BRACELET THAT IS IN BEAUTIFUL CONDITION, AND A NARROWER CUFF BRACELET THAT IS A WALLACE STERLING PIECE. THE LARGE PANEL LINK BRACELET IS THE STORY OF DON QUIOT’E I BELIEVE, IT TESTED STERLING BUT IT IS NOT MARKED ANYWHERE THERE , IT DOES HAVE 2 SPOTS OF YELLOWING TARNISH ON IT (1 IS ON THE BACK WHERE IT CAN’T BE SEEN WHEN WORN THE OTHER ON THE FACE TAG)THAT MAYBE A CLEANING COULD REMOVE IT? 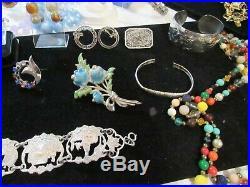 LARGE TRUART SIGNED BLUE BELL ENAMELED FLOWER BROOCH, CATAMORE SIGNED ROUND BROOCH WITH COLORED STONES, A RING AND EARRING SET OF CLEAR STONES SURROUNDING A LIGHT GREEN CENTER STONE, BEAU SIGNED EARRINGS AND SEVERAL SMALLER PIECES OF JEWELRY THAT IS MARKED STERLING. 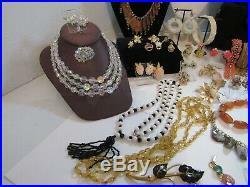 THERE ARE SO MANY PIECES OF JEWELRY IN THIS LOT SO IT’S IMPOSSIBLE TO DESCRIBE EACH PIECE SEPARATELY. PLEASE LOOK OVER PHOTOS CLOSELY FOR THEY ARE PART OF THE DESCRIPTION AND CONDITION, I TRY TO MAKE SURE THERE ARE NO MISSING STONES IM HUMAN I MAY MISS 1 OR 2 AND I TRY TO POINT OUT IF A STONE HAS BEEN REPLACED BUT IF IT MATCHES CLOSE AND FITS I LEAVE IT. 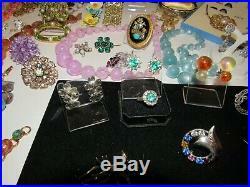 I ALSO TRY TO KEEP ALL WEAR AND OXIDATION TO A MINIMUM BUT BEING VINTAGE JEWELRY SOME IS TO BE EXPECTED AS IS SOME MINOR CLEANING NEEDED. 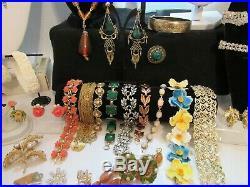 The item “NICE COLLECTION/LOT VTG. 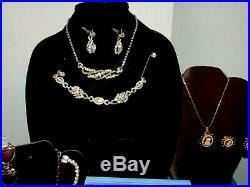 JEWELRY SIGNED/UNSIGNED, STERLING, GF, OVER 90 PCS” is in sale since Saturday, March 30, 2019. This item is in the category “Jewelry & Watches\Vintage & Antique Jewelry\Costume\Retro, Vintage 1930s-1980s\Collections, Lots”. 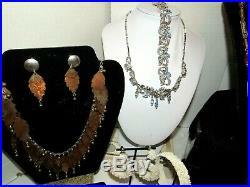 The seller is “bryanmolly390″ and is located in York, Pennsylvania. This item can be shipped to United States, Canada, United Kingdom, Denmark, Romania, Slovakia, Bulgaria, Czech republic, Finland, Hungary, Latvia, Lithuania, Malta, Estonia, Australia, Greece, Portugal, Cyprus, Slovenia, Japan, Sweden, Indonesia, Taiwan, South africa, Thailand, Belgium, France, Hong Kong, Ireland, Netherlands, Poland, Spain, Italy, Germany, Austria, Bahamas, Israel, Mexico, New Zealand, Philippines, Singapore, Switzerland, Norway, Saudi arabia, Ukraine, United arab emirates, Qatar, Kuwait, Bahrain, Croatia, Malaysia, Brazil, Chile, Colombia, Costa rica, Panama, Trinidad and tobago, Guatemala, Honduras, Jamaica, Saint lucia, Turks and caicos islands, Ecuador, Egypt, French guiana, Gibraltar, Iceland, Jordan, Cambodia, Macao, Martinique, Nicaragua, Pakistan, Paraguay, Viet nam, Uruguay.